Three months out of the year this is the home of Samuel Gray. This adobe casita located near Abiquiu, NM and in just a few years will be Sam’s full-time residence. It measures 12′ by 10′ on the exterior but due to the thick adobe walls has only about 86 interior square feet. He built it for less than $3000 and it’s powered by a simple low cost photovoltaic solar system. Continue and read about this Adobe Casita in Sam’s own words. There are more photos too. The total cost for the casita was a little less than $3,000. I could have saved 1/4 of that by making my own adobes. Soil from the site is ideal for adobe but I had time constraints at the time so I bought them from a nearby adobe yard. The local power company wanted $12,000 to run a line to me so I built my own electrical plant for $1,902. My homemade system consists of 2 PV panels, 4 golf cart batteries, a charge controller and a small inverter. That provides enough electricity for the casita and the water well. The best part is there’s no electric bill to pay. Thanks for sharing this great little house with us Sam! It’s great to come across people making their dreams come true in tiny low cost small homes. Your home is especially well done and an excellent example of how a small space can be comfortable, affordable, and attainable. This entry was posted in Tiny House Projects and tagged abiquiu, adobe, casita, cobb, dirt, earthen, mud, new mexico, nm, Samuel Gray, southwest, tiny house. Such a neat little building and so nicely done and what a great price. I imagine the land was pretty affordable there as well. Build another one or two and two people could easily live in something like this. Nice find Michael. I’ll ask but I suspect there is an outhouse of some kind. Is that concrete based stucko on the outside, or natural? I know most of the area houses outside of the tourist areas in Santa Fe and Albuquerque have gabled roofs to protect the adobe from the weather… Hope nothing gets damaged here, it’s a really beautiful home. I suspect Samuel put some kind of stabilizer (like cement) in the exterior stucco. The blocks themselves are probably stabilized with asphalt emulsion or cement too. Stabilized adobe blocks are really common and really hold up to the rain all by themselves. In northern New Mexico the pueblo style adobes like this one will last longer with a more water proof surface. But many people just stick with mud because it breathes better and if leaks form in a concrete stucco shell the adobe can actually melt away inside the wall. This can be a much bigger problem. It is also fairly common for the older adobes to just have mud and require re-mudding or patching from time to time, sometimes every year. The climate and sporadic rains makes this all possible. The other common adobe style you see in that neck of the woods has pitched roof, often 8/12 and 10/12. One these homes the mud stucco lasts longer for obvious reasons. On the same topic… my wife’s grandfather build an adobe in northern California decades ago. It’s been sitting abandoned for decades too and yet is still standing tall. I’ll take pictures of it sometime in the near future. It’s really amazing how well mud blocks hold up to the rain all by themselves. You’d think they would just melt away but ironically they don’t if built well… and for hundreds of years if maintained (like many pueblos in the South West) or roofed. All this talk of mud makes me want to build a tiny adobe 🙂 hmmmmmm? Since I don’t live there full time, I make do with a marine toilet, the kind used on boats. It’s basically a 5 gallon holding tank with a toilet seat and a small built-in water reservoir for flushing. They cost about $75 at K-Mart, in the camping aisle. I can dump it at a nearby RV park. When I move there full time in a few years, I’ll build a little “support pod” with modern plumbing. Sounds like a simple inexpensive solution. I am looking for same to rent. Know of any in the area? For rentals you might look at http://tinyhouselisting.com. 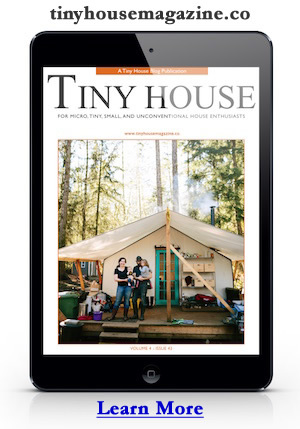 Also see http://tinyhousemap.com for tiny houses near you. Do you have the plans you could share? I am building a similar sized adobe north of Taos. 120 square feet or less does not require a building permit. Big plus. The outside is cement stucco applied over 2-inch rigid foam insulation and stucco wire. A more authentic way to do it is with mud plaster, the drawback being that it has to be reapplied, or at least patched, every year. Most of the locals use mud walls and floors. You know you live in a poor county when the local community college offers a course in mud floor construction. Samuel.. We have ten acres in El Rito that we want to build on. We would love to learn more about how you built your place and especially your electric solution.. and the bathroom?? Please contact us. We will be in the area mid June to visit. This is a beautiful home. I love it when homes are built using materials from the surrounding area. I would love to see more photos of the interior. The location is stunning, too! Awesome. I live up in Taos and go to Abiquiu all the time – it’s an amazing place, and what a great little house to live in. One of the commenters said that land is cheap there, but that’s not what I heard at all – Samuel, care to weigh in? I have been looking for land all over Northern NM and its really not cheap anymore! Again, great house and thanks for sharing. Have any more pics of the inside at all? I am a real estate broker . I can show you many acreages for $2000 per acre in the Abiquiu area. If you are interested, please contact me anytime. The pitched roof style is known as “territorial,” a more recent (19th C.?) adaptation of traditional Pueblo architecture. As for land prices, just wait. 🙂 Cheaper land found west of that area, too, although be advised that ethnicity counts. No, it’s not cheap. I bought my land there (5 acres) about 15 years ago and it wasn’t even cheap then. I don’t really keep up with the market as I don’t intend to ever sell. My neighbor has an almost identical patch of land and he said it appraises for $30k per acre with nothing on it and no water rights. I don’t know what the market downturn has done to prices but I do notice more stuff for sale every time I go up there. It’s really a strange paradox that one of the poorest counties in the U.S. has such high real estate prices. I agree Sam – land is absurdly expensive in a place that is so incredibly poor. This is simply not true. Land prices start at around 2,000 per acre. I can help find land or sell some of mine. In general, a cement based finish on adobe is the death of the it because it seals the adobe which would lead to moisture problems deteriorating the wall, but this may work in a dry climate. Since Samuel also used pre-made bricks which would have already been sun-dried, there wouldn’t have been too much moisture release from the walls. Only the moisture from the adobe mortar. Also, the general rule for moister, wetter, climates is “good hat, good boots” for adobe, which means you need to have adequate cover from rain and appropriate means of preventing moisture absorption from the ground. Be forewarned, anyone thinking of building with adobe (like I am) to do your research and use methods which are appropriate for your region. New Zealand has approved standards for building with adobe. Cement stabilized bricks and coatings are ok if the entire structure is made from the same material, but if you do this, you lose many of the benefits of the adobe earth (such as its ability to regulate moisture levels). 1998 Engineering Design of Earth Buildings is primarily aimed at structural and performance aspects when designing an earth building. It is intended for use by structural engineers. 1998 Materials and Workmanship of Earth Buildings defines the materials and workmanship requirements for the use of unfired earth in the form of adobe, pressed earth brick, rammed earth or poured earth. Tests and the required results are detailed so that assurance can be given that the earthbuilding material will meet building code requirements. 1998 Earth Buildings not requiring Specific Design sets down the design and construction requirements for adobe, pressed earth brick and rammed earth buildings not requiring specific design by an engineer. It is intended to provide a basis for the detailing of houses and small buildings. I have wanted a little casita for years. I’m glad to see this. I have lots of family in the Albuquerque/Santa Fe area, this would be a nice little get away place. Thanks! i adore it. i grew up in mud houses and we had to make repairs every few years but we used grass for the roof. i’m currently looking for a tiny home to withstand alaska but this would make a great winter home. i like the boxiness. reminds me of a vintage volvo. Nice little house! I used to live in Alaska, build a small log house there with sod roof. Live in Talkeetna, great little town. This is a great little house. I have some land in Southern NM and would love to build something just like this. Could you give more information on how to build my own homemade energy panels? Very nice – If you live here full time, soon, do you consider yourself a hermit? Sam’s little adobe is 10×12, the size limit for requiring a building permit. Over 120 sq ft requires permit, under does not. We bought 7.3 acres in that area for around 8K an acre. No water no electricity. We currently haul water, have solar power and a state of art composting toilet. The views of the Pedernal are priceless. But it is truly the wild west. One day, I’m going to have one of these as a writing house! I would like to buy or have built a small adobe with a art studio near Santa Fe area. Don’t want to be too isolated. Any suggestions or know of any for sale? Would love to be off the grid. If you would email me, I will send you considerations available. Is there another more detailed story about your place? Quentin Wilson sent me a link one time but it no longer works and it had more detail on how you built and details on the inside. Thanks for your response. “a small kitchen counter”? What kind of food storage and preparation facilities does it have? Fridge? Stove? Sink? Whoa, it’s been awhile since I checked in here so let me try to answer a few questions. James: plans? It’s just a simple rectangle with no plumbing or foundation penetrations. You don’t need blueprints, just get a shovel and start digging the foundation! Severan: well, it is dry here. We get about 8 inches of rain a year and you don’t want to be here the day we get it. Stucco over foam over felt has always worked out well here. My little casita is almost 15 years old now with no sign of any kind of deterioration. If you’re in a humid climate, I would advise against a mud house. Carol: Home Power Magazine is a great source for home brewed solar electric systems. Andy: Ha, ha, that made me laugh. Yes, I am definitely a hermit, digital and otherwise. I’m a retired university professor and I prefer the solitude I now enjoy. Today I saw an eagle, bull snake, rabbit, lizard, and I heard the coyotes howl. I’ll take that to “civilization” any day. Oh, and even us hermits have iPhones these days for Internet. Rudy: in New Mexico you don’t need a permit for any building under 200 sq ft. At the time I built it, the limit was 120 sq ft, hence the 10 x 12 footprint. Stephen: I mostly eat fruit, nuts, piñon, an occasional rabbit, and burritos from Bode’s, which is only a one mile walk. The lady down the lane sells me eggs and my neighbor has honey. Refrigerators are overrated. Solar ovens rule. When all else fails, build a fire. I am going to e-mail you for the Home Power Magazine pdf. I had always dreamed of visiting NM and after visiting few years ago, just loved it so much. Your house is so awesome. Thank you for sharing. VERY CUTE! LOVE adobe homes-the ultimate artist home..I have wanted a tiny home for quite a while and been looking at so many but none like this. Always felt drawn to New Mexico/Arizona also. I think I would want one a little bigger..200 sq. feet maybe as I know the walls will reduce that available square footage but want to have a kitchen and small bathroom,etc..This little one would make a great studio-I am an artist and musician,so always thinking of a place for studio. I wonder what a bigger one like this would cost..? 200 square feet or so? Really nice..
Samuel or anyone have names of adobe contractors in the Abiquiu area? I have a weakness for this kind of developments consrtructive, smooth and round with soft curves shaped artistically always captivanting. Me too. I lived in the southwest for years (Sedona and Albuquerque) and the aesthetic really grew on me.